Senior CRPF official Zulfiquar Hasan says paramilitary forces being deployed in Jammu and Kashmir to secure upcoming elections in the state. Srinagar: The explosives laden vehicle that rammed into a Central Reserve Police Force (CRPF) convoy killing 40 personnel could go undetected on 14 February as it was not a part of the CRPF’s threat assessment before convoy movement took place, a senior official has told ThePrint. “Before convoy movements, our threat assessment is mainly for Improvised Explosive Device (IED), grenade attacks and stand-off fire. Over 22 companies, which means 2,200 men were there as part of the road opening party on February 14,” said Zulfiquar Hasan, IGP (Operations), CRPF. “They checked all the highways for IEDs, grenades and standoff fire. A civilian vehicle laden with explosives was not part of the threat assessment,” said Hasan. Since the terror attack took place, questions have been raised about how an explosive-laden vehicle could enter an area which has such a high security deployment. The usual drill before a convoy movement involves deploying 22 companies comprising 2,200 men on NH-44, from Jawahar tunnel till Srinagar, to secure the road. The CRPF, which is the largest paramilitary force in the country, sanitises the road in tandem with the Border Security Force (BSF) and the Indian Army. Hasan said earlier during convoy movement, civilian traffic was not allowed to ply on the highway. But complaints poured in from civilians about how stopping their vehicle during convoy movement was resulting in unnecessary delay and hardship. “So, the ban was lifted and for the last few years, civilian vehicles could ply even during convoy movement,” the IGP (Operations) said. 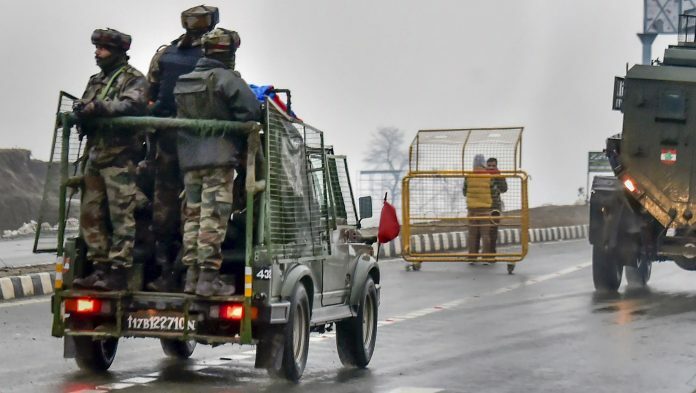 After the Pulwama attack, the earlier restriction imposed on civilian traffic is back. “Now that similar attack can happen in future also, we have started stopping civilian vehicles from plying for short period during convoy movement in sections of highway according to our safety and civilians’ convenience,” Hasan said. At present, over 60,000 CRPF men are deployed on the ground in Kashmir. Contrary to perception that the government was deploying more forces, which included the CRPF, BSF, Indo-Tibetan Border Police (ITBP) and Sashastra Seema Bal (SSB), in the wake of a war-like situation building up, Hasan said the paramilitary forces are being deployed to secure the upcoming elections in the state. “With the existing force we can’t conduct elections. In sensitive states, especially like Jammu and Kashmir and states affected by Left Wing Extremism, you have to start redeploying forces in a phased manner and much ahead of time,” Hasan said. The CRPF took lessons from the 2017 bypolls for the Anantnag and Srinagar parliamentary seats, where 100 paramilitary companies were deployed to secure the election. “Only half of them could come as the highway was closed after a landslide. Taking lessons from 2017, we realised that airlifting is easier during winter months when the roads get blocked,” Hasan said. Another senior CRPF official said that five to 10 companies are landing in Srinagar daily. The government deployed 100 companies of paramilitary forces, including CRPF, BSF, ITBP and SSB, in the state last week. In Kashmir, there are complexities involved, said Hasan. “For instance, NH44 got blocked today because of snowfall. So, road movement can’t happen till the route is cleared. We have to factor in all these and prepare in advance,” said the CRPF IGP (Operations). Although in the immediate aftermath of the 14 February attack, the men were disturbed as many of their fellow colleagues got killed, the CRPF men were back on duty the same day. “They were back on the job the same day. Nobody took a day off. They know its part and parcel of their job,” said Hasan.